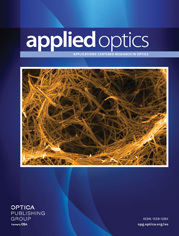 The authors are with the Applied Optics Laboratory, Toyota Central Research and Development Laboratories, Inc., 41-1 Yokomichi, Nagakute, Aichi-gun Aichi 480-11, Japan. Recently, polymeric multimode optical waveguides have been widely studied for low-cost interconnection use. We describe fabrication processes for a low-loss poly(methyl methacrylate) (less than 0.1 dB/cm at 675 nm) waveguide based on the reactive-ion-etching technique and for a slope (45° mirror face) formed on the waveguide. To obtain a ridge core with a crack-free and extremely smooth surface, we applied a heating process at a temperature greater than the glass transition point and a smoothening process by solvent. Furthermore, to fabricate simultaneously both vertical and sloped sidewalls, we applied a unique phenomenon in the process that decreases the etching rate directly under a narrow opening of etching mask. By using the above fabrication techniques, we demonstrated an out-of-plane branching mirror.